I Love this book! I’ve never been a big fan of reading about history, but a ghost army? a princess who was a spy? and exploding muffins? This book got me from the start! 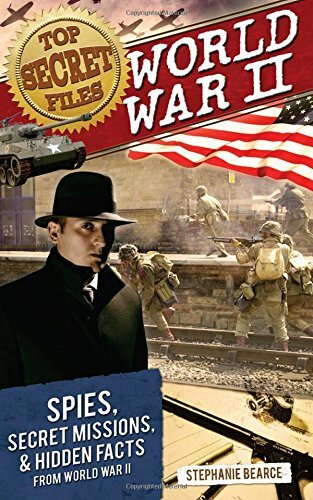 From spy school, where the first test was to find the school, to Camp X, in Top Secret Files: World War II readers will find out how ordinary people learned the spy business. My favorite part of the book was the section about real spies, which included an Australian journalist, an English magician, a French princess, a British children’s author, an American major league baseball player, and a famous African-American dancer. Kids will read about special missions, where even Hollywood got into the act, and secret weapons like rat bombs and doodlebugs, and how a future famous chef mixed up a secret concoction to keep sharks away from the explosives. There were secret forces that made 3-D glasses and flew in pink planes, and talked in code that no one else could figure out. And so much more that kids won’t find in their history books. At the end of each chapter there are special spy projects where readers can try out their own spy skills. Stephanie Bearce’s quick-paced writing draws you in, as do the illustrations and photographs. The reader is sure to be hooked by these true, behind-the-scenes stories of World War II. There is a bibliography, including websites, at the end where readers can find out more. This is an excellent read for students as well as adults who want to know more than just dates and dry facts.